Fixed. The console just froze up is all. It does that every few months or so. A simple restart of it and it's back up. It doesn't effect any games eithet. Xirre, seems like the server 1 is offline. It seems like you have still yet to use your server. Whenever you are around and ready to use it, let me know and I will reset your server expiration date back to 31 (a full month). Just know that if you wait too long your files will be automatically deleted. 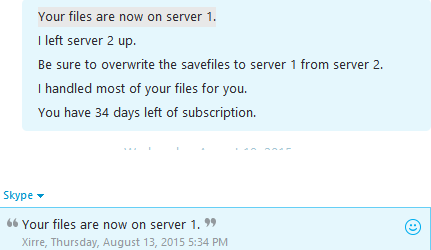 31 days after your expiration date hits 0 you will have your files wiped. This is to keep things clean. In short, we only keep files for a month after someone hasn't paid again. Hey there Xirre, I have no other way to contact you. Allow your admin team/friends to startup or shutdown your game! A Fantasy game made to be played with RP or PVP but only one. It is the choice of the Admins. Shuffles a list easily. No matter the size. Gathers multiple key presses and moves the user in those directions. A simple method to pan to a certain location. Want to experiment with particles and have the code to save as well? Here you go! A more efficient method of pathfinding.